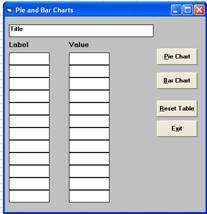 The following tutorials describe how to create pie and bar charts in WINKS SDA and how to create Excel Pie and bar charts from WINKS. The files needed for these examples are in your WINKS file directory. 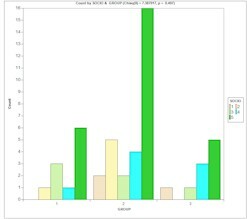 Create a simple bar chart from frequencies – WINKS counts items in categories and creates a bar chart. 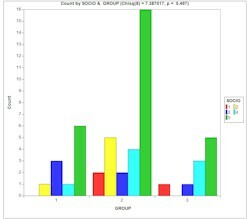 WINKS counts items in categories and groups and creates a bar chart. To highlight item 5 as purple, open the options menu, select color, select category 5 from the drop down menu, and click Bar Color and select purple. Click on Bar Options and select Horizontal. Click on Image, Click Browse and select MistyForest.BMP as the image and click the show background Image checkbox. 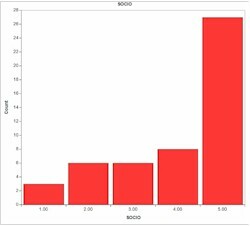 Click on Labels/OK and Ok to display this version of the chart. In the options dialog box, take off the image by clicking on the Image tab and uncheck the image option. 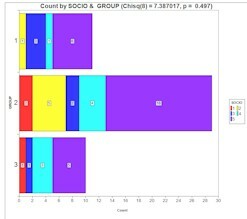 In the Bar Chart tab, select stacked and horizontal. Also click show numbers. In the Color tab, select black as the fore color for text. Also click the Bright button. Choose Labels/OK and Ok to display this chart. Try other options – there are thousands of ways to change the graph to meet your needs. 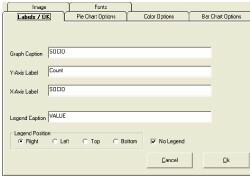 Select VAR1 and VAR2 as data fields, and Label as the label field. 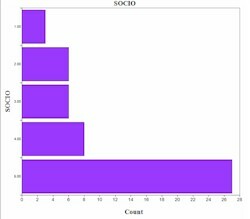 The following chart is displayed. 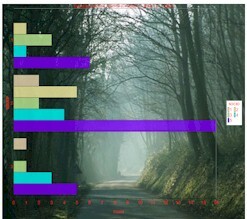 Use the same editing options illustrated for Chart from frequencies to customize this chart. 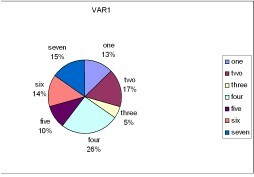 Enter number in the Label and Values field, click on Pie Chart or Bar Chart to display the chart. 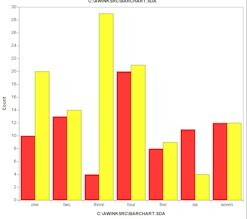 Edit the chart as illustrated in previous examples.